Procurement Landscape Transformation options from SAP has “Integration Strategy” as one of the important landscape decision to make. Simplicity: A single gateway with prepackaged mapping content to make integrations fast and painless, eradicating the effort and expense of one-off, adapter-based integrations. Speed: Automated processes eliminate lengthy deployments and manual testing, enabling you to complete integration in a fraction of the time formerly required (50% implementation time saved) – and make stakeholders happy with go-lives that happen in weeks, not months. CIG is good news for everyone, For customers, there is no subscription fee hence better ROI (Return On Investment) on Ariba implementation. For consultants, no need to have technical integration experience (like you need in case of SAP PI/PO) to implement this product. Objective of this blog is to introduce SAP Ariba consultants, Integration consultants and prospective customers to CIG in simplistic but in detailed manner. This blog is structured into three sections: Understand, Learn and Implement. To understand the overall Ariba integration architecture with CIG we need to understand various components involved. Note that the enablement components are shown as dotted lines for better understanding. Observation: There is no Ariba ITK (Integration Toolkit) in the architecture as the capability is in-built in CIG and CIG add-on. Note: Ensure that you get comfortable with Abbreviations SCP, CPI, CIG at this stage of the blog to avoid potential confusion as you read through. The first of the many steps taken by SAP to make integration easier between on-cloud solutions and on-premise solutions was way back in year 2012 when SAP launched the idea of SAP Cloud Platform (SCP). In this blog we are interested in integrate everything (Solutions, Things, Data etc.) offering of the SCP. Developers can develop extensions on SAP Cloud Platform and then connect these new extension apps to the core solution via API available. Thus the Cloud platform have to have API and as big picture the integration service to enable the integration with other solutions. 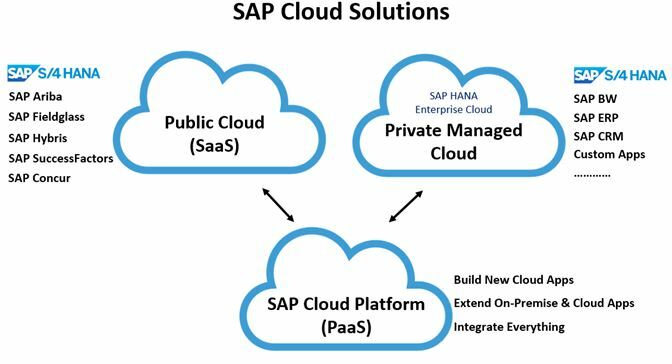 This integration service is called “SAP Cloud Platform Integration” (CPI). In the diagram below, you can see On-premise managed cloud solution like S/4 HANA on the left hand side and Public Cloud solution Ariba is on the right hand side. These both solutions are integrated using the platform integration service. Lets have closer look at it in next section. SAP CPI service is available via https://api.sap.com and is hosted on SAP Cloud Platform. This service can be used to integrate any on-premise or third party systems with the cloud solutions from SAP. Following are the features of SAP CPI which will benefit Ariba Customers in long term. Multi-Level security: As this is cloud platform the security is taken much more seriously by SAP with offering like payload encryption, own tenants for customers, customer data in database is separated via different schema for each customer and customer can encrypt their data with own key before persisting data to SAP Cloud Platform. All the above Ariba prepackaged mapping content will be displayed in the Cloud Integration Gateway as soon as you enable it on your Ariba Realm. Harmonized web services does not need any mapping hence web services between SAP Ariba and S/4 HANA does not need any mapping in standard fields. Thus one major task done without any efforts and time spent. 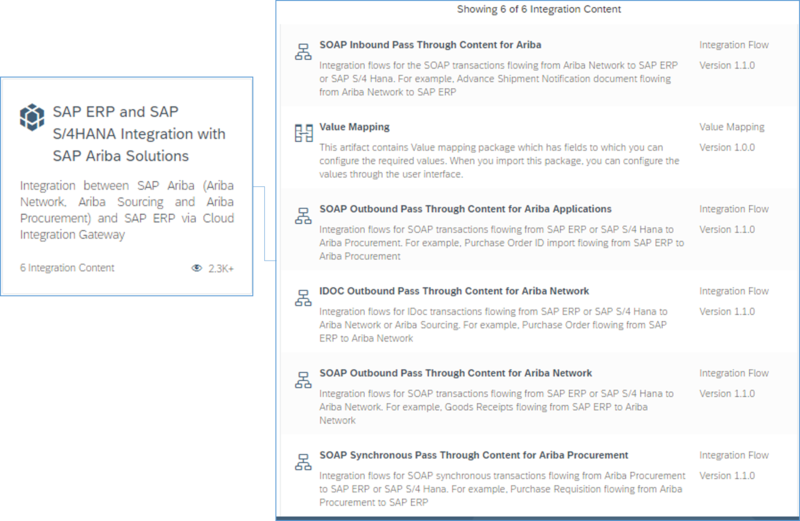 Still if you want to see the integration flow you can visit the packages for Ariba on SAP CPI. 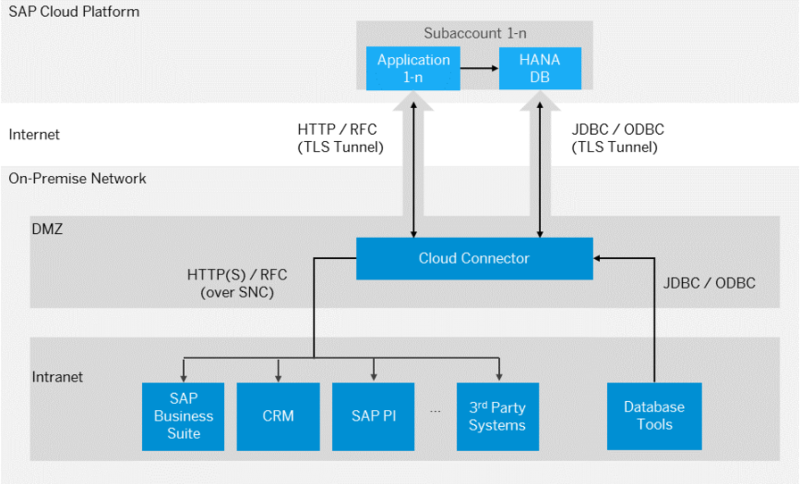 SAP Cloud platform connectivity service is used to establish connections between cloud applications and on-premise systems. Access HTTP, RFC and TCP protocols for cloud to on-premise communication and JDBC/ODBC for communication with cloud databases. For your cloud applications, you can use LDAP-based user management if you are operating an LDAP server within your network. Use an identity provider to simplify the access of SAP Cloud Platform users to on-premise systems. 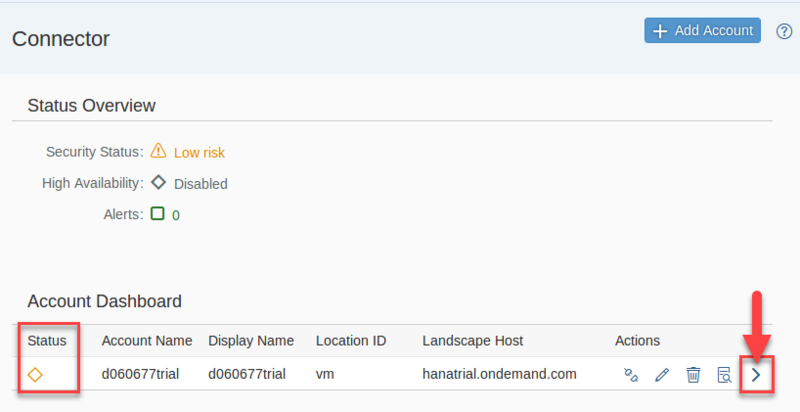 For this purpose, you can configure a trusted relationship in the Cloud Connector to support principal propagation. 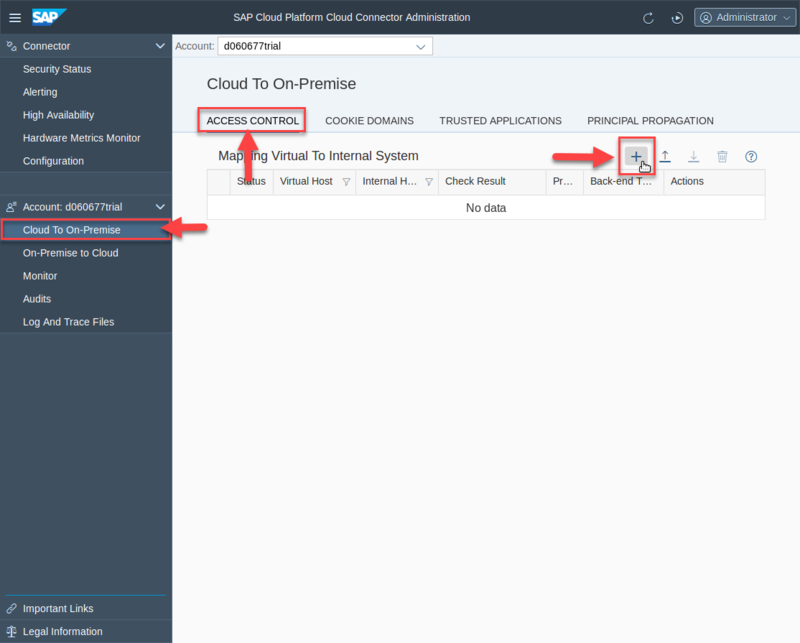 You can see that Cloud connector is the main software that needs to be installed in the firewall of the on-premise system to connect to the subaccount of the SAP Cloud Platform. There are two options to connect on-premise system to on cloud system. Cons: Configuration of DMZ and firewall needed, attacks from internet possible, not all protocols supported. 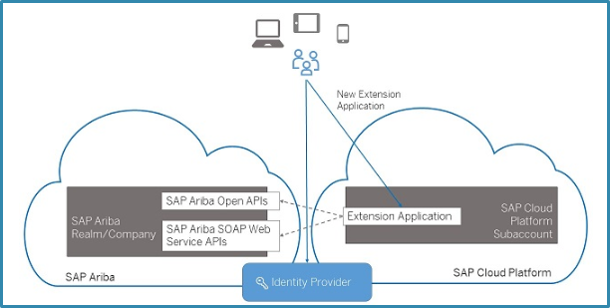 Thus due to its minimal configurations, high security and support for multiple protocols, it is recommended to use cloud connector for connecting Ariba to SAP ERP/ S/4 HANA on premise. There are two CIG add-on, one for SAP ERP and other for SAP S/4 HANA. These can be downloaded by your SAP Basis consultants and can be installed using transaction/utility SAINT. SAP Ariba Cloud Integration Gateway, add-on for SAP ERP: The add-on is installed on SAP ERP system. The add-on enables SAP ERP to communicate with Ariba Network and SAP Ariba solutions through SAP Ariba Cloud Integration Gateway. Single Gateway to integrate SAP Cloud solutions to other cloud or on-premise solutions. Thus SAP Ariba Cloud Integration Gateway is a simple and efficient way to integrate through one gateway to Ariba Network, SAP Ariba cloud applications, Non SAP Cloud solutions, Internet of Things and trading partners. Refer to the diagram below to understand the broader integration coverage of the Ariba CIG. NOTE 1: The initial release of SAP Ariba Cloud Integration Gateway focuses on SAP ERP and SAP S/4 HANA integration. However, the SAP Ariba open adapter powered by Liaison Technologies and Dell Boomi is the recommended integration option for customers running on non-SAP ERP systems. NOTE 2: There is no additional subscription fee for CIG for customers who have subscribed to SAP Ariba solutions. Now its time to deep dive into Cloud Integration Gateway to know its features and compatibility. To learn this new method of integration we will start with learning the features of this gateway followed by supported applications, supported business processes and lastly integration architecture withe CIG. Now we know that Ariba CIG is set of tools to make Ariba integration easier while these tools use many services from SAP CPI to work in harmony. Below is the table describing all the features of the CIG. Refer to the features covered in CIG Overview Blog. Ariba CIG right now supports most of the Ariba applications for buyer side integrations and Ariba network sell side integrations. Sell side integrations for applications like Supplier Life cycle & Performance (SL&P) and Spend Analytics are expected in the year 2019. 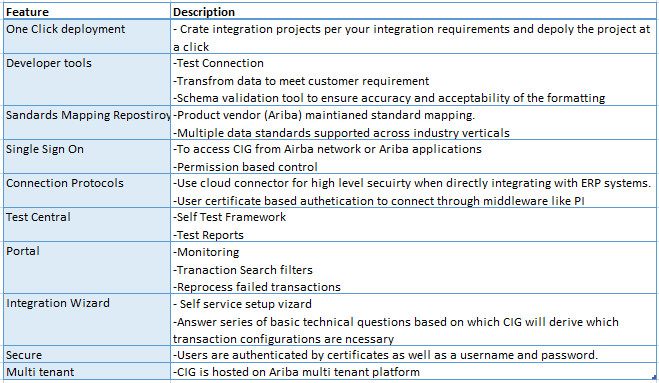 Refer table below for the Ariba applications supported by Ariba CIG. Ariba CIG supports following SAP ERP versions. Let’s have another look at the Ariba integration architecture without showing CPI as separate element for better understanding of the implementation as we move on to the next phase of learning CIG. Lets move on to the next phase of implementation, where we will look at Ariba CIG generic implementation steps (not specific to particular Airba solution). 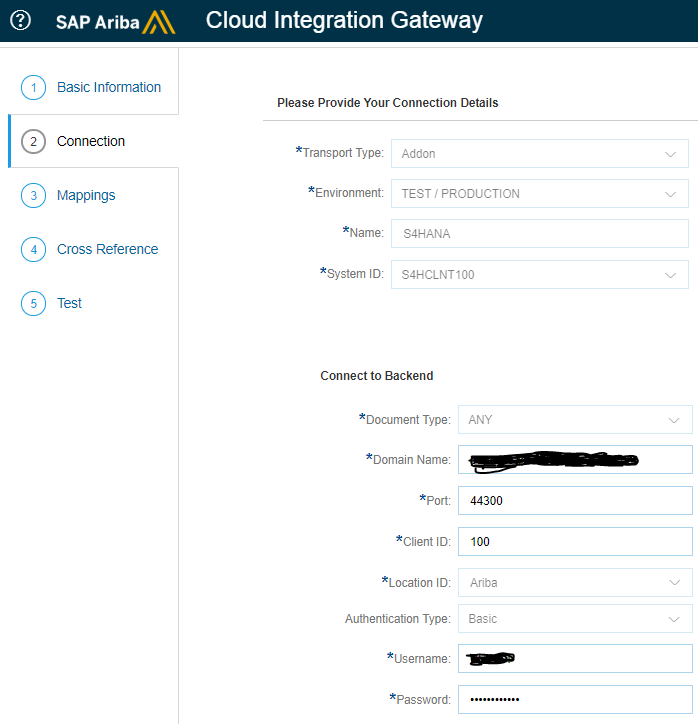 Configurations to Enable Cloud Integration Gateway: Install S/4 HANA Add-on, install Cloud Connector, Ask SAP to enable CIG on Ariba solution, configure SAP ERP/ S/4 HANA global settings. Configure time, time zone settings and Formats in S/4 System. To install add-ons, see SAP Note 1841471. Once installed, check the status in your ERP system and you should see ARBCI1 & ARBCI2 components. Download the Cloud Connector installation archive (msi installer for windows) from SAP Development Tools for Eclipse. Install the Cloud Connector software as per the on screen instruction of installer. 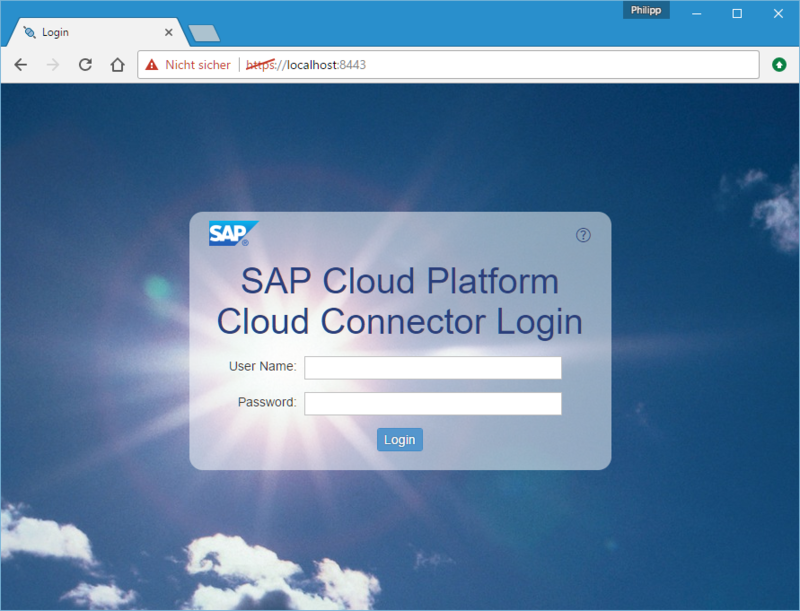 Once installed you can login to the screen shown below with your SAP Cloud Platform subaccount ID. Ask SAP customer support to enable Ariba CIG on your Ariba Realm. once enabled then you can see CIG from following path with respect to the Ariba Solution being used. If you are navigating from Ariba Network, use the following path: Administration > Configuration > Cloud Integration Gateway set up > Go to the Ariba Cloud Integration Gateway. If you are navigating from SAP Ariba Procurement / Strategic solutions, use the following path: Administration > Integration Manager > Cloud Integration Gateway > Go to the Ariba Cloud Integration Gateway. 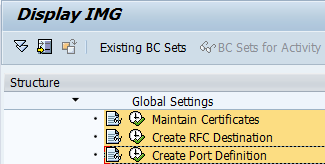 Configure Global Settings (Maintain certificates, define RFC destination, and define port definition) in S/4 HANA system. Take help from your security expert to set up certificates for Single Sign On between Ariba, S/4 HANA and SCP subaccount. 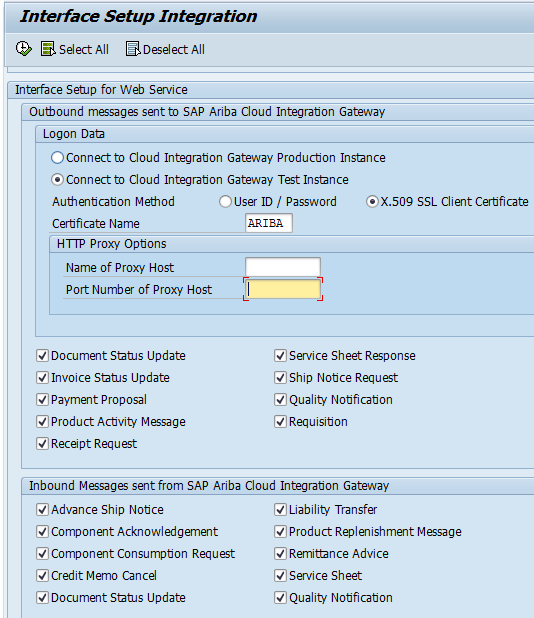 2.1 Create and set up projects on SAP Ariba Cloud Integration Gateway. 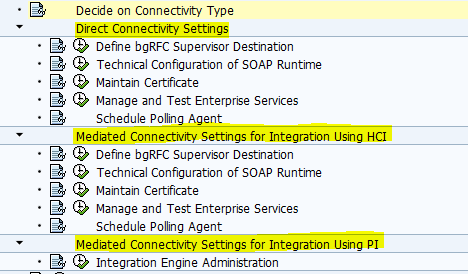 ii) Complete Connection settings and test the connection to Ariba solution. 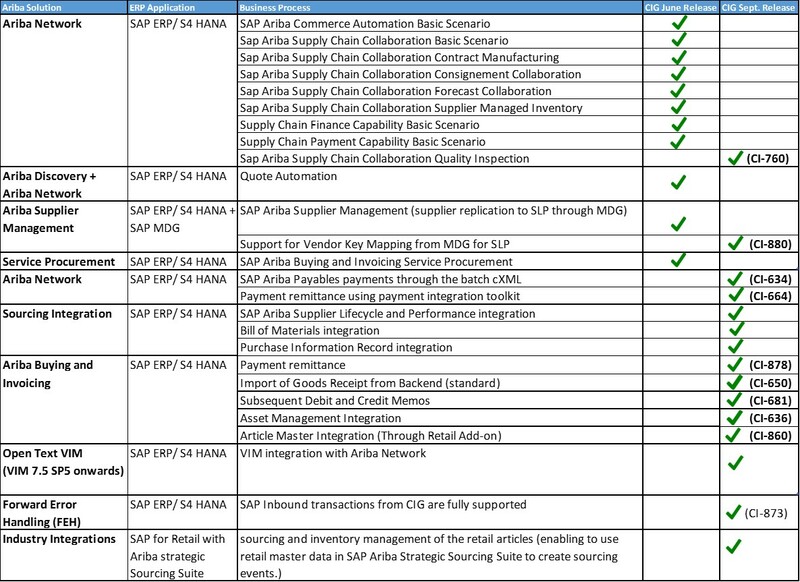 Using the document status update, you can monitor status of all transaction that you send from your SAP ERP or SAP S/4HANA system through SAP Ariba Cloud Integration Gateway to suppliers on Ariba Network and send the document status update for transactions that you receive, to suppliers on Ariba Network. ii) Maintain Date-time to send Doc. Stat. Upd. for PayMeNow and Order Confirmation. iii) Define Background job for for PayMeNow and order confirmation document status update. Using transaction SM36 schedule program “ARBCIG_INBOUND_IDOC_SUR”. Note that AITK (Ariba Integration Toolkit) is no more required to transfer data between backend and SAP Ariba once CIG is configured for the same. Following are the summary of various configurations to be maintained for Master Data. 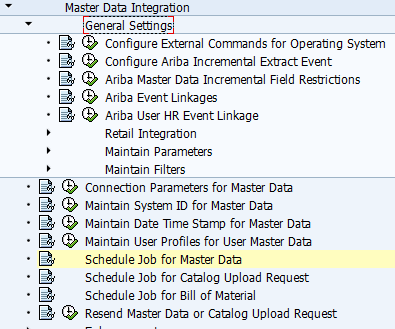 Ariba incremental events for CIG can be activated from this configuration. Now that events are active its time to link them to trigger the events when needed. NOTE: we have now looked at master data configuration steps which are common to all solutions. Suggest that you go through the configurations for individual solutions on your own. After master data integration it is time to focus on configuration for transaction data. As there are many Ariba solutions, let’s focus on the Ariba network settings as part of this blog. If you have already maintained certificates then you need not assign credentials through following config. If you opt for it then note that An Ariba Network ID can have multiple end points. An end point is a document routing placeholder that ensures documents from Ariba Network are sent to the required destinations (system). The Ariba Network ID is displayed to suppliers on Ariba Network. You can have one or several IDs. For example, each company code or purchasing organization can have a separate ID. The Network ID is transferred with each outbound cXML message and identifies your company as the sender. In this customizing specify which cXML message types to be exchanged with the business network. This is information for further configurations on connectivity. for example, we chose direct connectivity and hence following key configurations are discussed. 5.1.4 Define Background user and Supervisor destination. Maintain user “BGRFCSUPER”. Assign the Authorization Role “SAP_BC_BGRFC_SUPERVISOR’ in client “000” of S/4 HANA system. Define RFC destination “BGRFC_SUPERVISOR” with above system user. Cross references to Test and Production system of Ariba to S/4 HANA or SAP ERP are maintained in this configuration. UOM Template: Ariba Value is shown and can be mapped to customer value for that UOM. Lookup Table: Lookup for document types or name value mapping can be maintained here. Create test scenario through self test process in CIG in single click. Last step is confirm the project and raise request to SAP for deployment. As you can see integration effort on CIG are minimal while SAP consultants still have to manage lot of configurations on S/4 HANA or SAP ERP side for tighter integration. Happy reading and feel free to ask questions in reference to this blog will be happy to respond as much as possible. Thank you very much for this level of detail, it will be very useful when doing migration projects from ECC to S4. Very well documented this topic. I got good understanding. However Figure 13: Ariba Integration Architecture with CIG (Revisited) confused me bit. What exactly is the role of HCI/CPI here??? When HCI/CPI is required? And at which step of integration?? First diagram is to clear the concept that CPI is component of SAP Cloud Platform as service. This CPI component holds the interface repository along with mapping information (basically holds standard content). CIG on the other hand is the Ariba Side portal providing implementation wizard which use the CPI provided content. Beauty is you can implement this from simple steps in CIG without even having to connect to CPI because it is native to CIG. 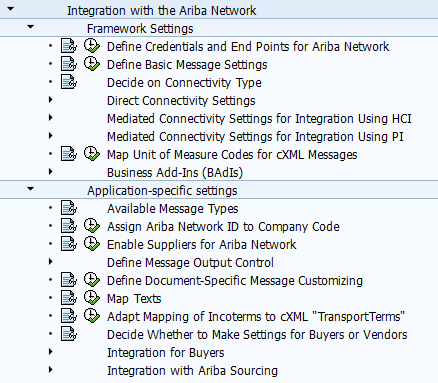 So when you select “Ariba Buyer” application in connectivity step system enables the standard content (from CPI) for “Ariba Buyer” integration. Thus you do not need the technical skills of importing the content, implementing the integration scenarios, creating routing etc. Second diagram is standard SAP provided architecture diagram. 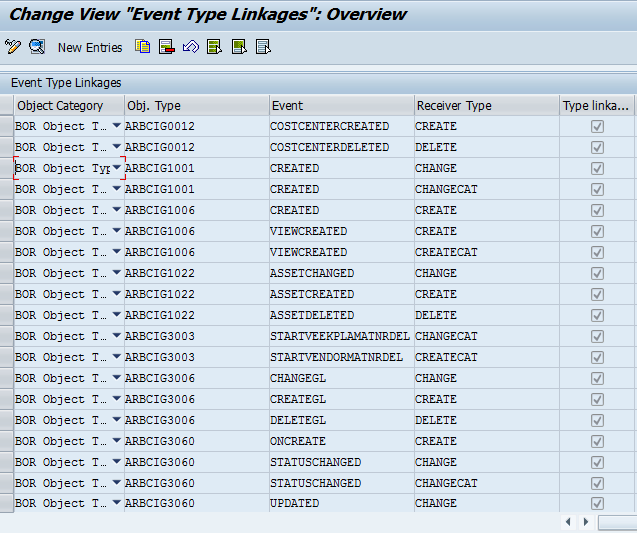 As it is something you will see in many other SAP documents so included. First diagram is good enough if intention is to understand what component belongs where. Hope this answer clarifies your doubt. As per this document and reply, I understand that CPI is within CIG and no need to do any configuration of CPI needed like importing the iflows, routing, etc. Is there any option to have CPI and CIG in place to connect with Ariba Network? We are planning to implement this integration and we are planning to use both CIG and CPI. I couldnt able to see any document related to use both CIG and CPI. table 5 you wrote CIG is not supporting to ARIBA SLP , i do not think its true please check . It does supports SLP. One point i can make it out is configuration shown in SPRO is only limited to DIRECT CONNECTIVITY and not via PI or Mediated connectivity, isnt it ? put some light on that too if it is there? Also i believe there must be an integration issues from ECC side or S4 side too , can you also discuss those like learning captured and SAP notes if any to overcome those ? Table 5 is removed now as most of the non-supported flows as of June release are now supported in September 2018 release. Table 4 is updated with release level (of both releases) support of the business processes. All connectivity options are supported as mentioned in Figure 36, it is just that this blog is limited to direct connectivity settings that too not all. 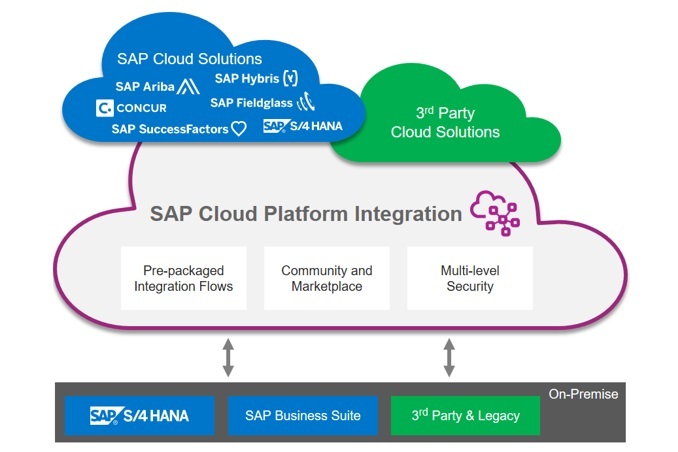 Yes there are integration issues related to Business partner integration programs starting from S/4 HANA and we also have an ongoing issue on the connectivity being handled by SAP. Very nice post, thanks a lot ! Thanks for the excellent blog!! Very informative. Do we have to maintain the S4 Connection to Ariba Network and Ariba applications to CIG in Ariba CIG UI ? Do we have an Option to choose if we want to the Integration via IDOC or Webservice for a specific interface? Is it advisable to make customization in Ariba CIG through enhancement and BADIs or should These enhancements be handled in Middleware like PI / PO or CPI ? Thanks a lot Manoj. Very detailed and informative post. Manoj, thank you for this wonderful post regaring CIG. But could you clarify support for non unicode SAP systems? We are running on ECC6 EHP7 (SAPKH61712/ SAPKH61713) and going by your blog, the version is supported. But our systems are on Non-Unicode. Is CIG compatible for us? Excellent article. There is only one thing that should be corrected, the section related to application settings including the screenshots refers to the BSAO Product. The CIG configuration is slightly different. Could you please clarify to me if I need to have SAP Cloud Platform Account with Cloud Platform Integration Service if I want to integrate SAP ERP with Ariba using CIG? We are planning to install CIG add on on ECC 6.0 EHP7 system. Can you please let us know if there are any pre-requisites that needs to be considered before we start with add on implementation ? Just so you know out SAP_APP is already on 617. Do we need to check/correct anything apart from this? Any idea on using Ariba CIG for integrating Ariba SIPM system with S4 Hana, any document or link related to that.